Mitchell is a 26-year-old young man who has lived with anxiety and depression for many years. Mitchell’s disability impacted his life in different ways, he had not yet had a job and spent most days in his home. Mitchell worked with his doctor to successfully manage his disability allowing him to begin considering employment. Mitchell met with the employment coordinator and the employment outreach specialist at CCRW and was very shy at first. 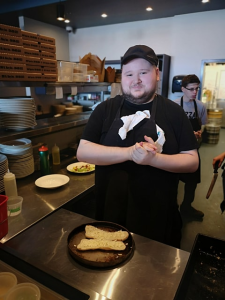 After a while Mitchell began to open up and shared that he wanted to work but felt that due to his anxiety, he would be more successful in a position with less customer service interaction. Mitchell disclosed he would not mind working in a restaurant and CCRW assisted him in obtaining his safe food handlers certificate. Carbone Coal Fired Pizza in Winnipeg, MB is an inclusive employer with a chain of Coal Fired Pizza Restaurants, serving exceptional quality food with great service. Kayla-Rae, the General Manager interviewed Mitchell after CCRW contacted her and discussed how Mitchell could be a great asset to their company. Kayla-Rae interviewed Mitchell and decided he would be best accommodated in a back of house position at their Westwood location. CCRW provided Carbone with a wage subsidy so that Mitchell could have additional training, having never worked prior. CCRW staff connect regularly with Mitchell’s direct supervisor and they are very happy with his performance. His supervisor states she has seen him flourish and Mitchell is happy to be part of the team.